"Family cloths" reusable toilet wipes: gross or great? “Family cloths” reusable toilet wipes: gross or great? Many of us who try to lead eco-conscious lifestyles are likely already using many reusable, washable fabric items for both household and personal use. Cotton dish cloths, washable baby diapers, handkerchiefs, and Glad Rags-type menstrual cloths are growing in popularity, but there’s one area in which we may all be eco-offenders: the ‘loo. Enter “family cloths”, also known as reusable toilet paper. These are washable strips of cotton flannel that folks can use to wipe with, but are they just too gross for most people to consider? The fluffy white toilet tissue that most of us use to dab at our nether-regions is usually made of virgin tree fiber, unless we’ve gone for a brand that uses recycled materials. Using TP with recycled content is better for both trees and the planet’s water supply, but there’s still a lot of processing that’s required to create it, and there’s likely to still be some old-growth forest wood pulp in there too. If we’d like our personal care habits to be as eco-friendly as possible, what other options can we look into? Short of keeping a pile of mullein leaves or a bucket of water and a ladle beside the toilet, there aren’t too many alternatives that don’t involve something disposable. There aren’t many of us who would truly balk at the thought of using washable cloth diapers for babies and toddlers, but the thought of wiping away our own excretions with strips of flannel cloth and then washing them later seems to be an entirely different story. Most people seem to go a bit green and twitchy at the mere thought of these cloths, so actually using them would be out of the question — despite how much better they are for the environment (and our bodies) than toilet paper is. Have we always been so squeamish about our bodily functions? Would switching over to washable fabric wipes really be that disgusting? Most pro-cloth websites do a good job of dispelling the hideous imaginings that many may have about whether the practice is sanitary or not, and advocates have described a variety of methods that they use for keeping things clean and tidy. It appears that the standard method of using these cloths is to keep a pile of clean cotton flannel strips near the toilet (apparently a facial tissue box is great for storing them), and something akin to a diaper pail with a lid nearby for the soiled wipes. Apparently these pails are half-filled with solutions made with either vinegar, peroxide, or essential oils to stave off bacterial growth and unpleasant odors once the used cloths have been tossed in, so that pail can just be up-ended into the washing machine every other day to swish everything clean again. That doesn’t sound terribly impractical, but it does seem to add up to more laundry being done, and that’s another source of wasted water. 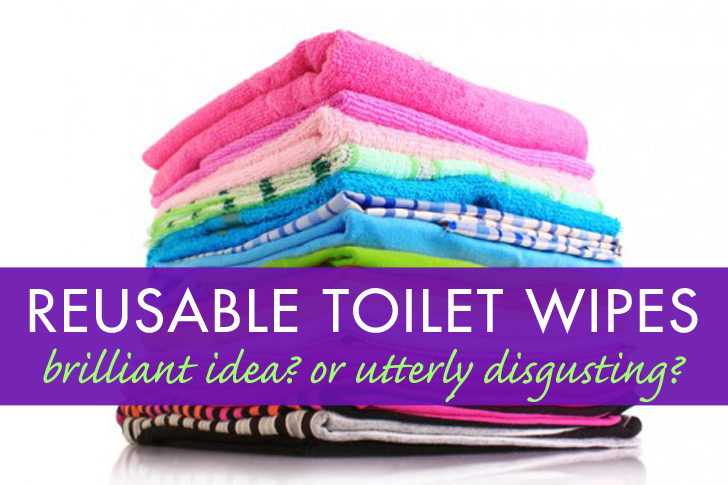 Let’s take a look at some of the positive and negative aspects of these washable wipes. It would appear that the pros and cons are pretty much equal. Proponents claim that hemp or bamboo cloths have natural anti-microbial properties and are thus better to use than cotton, but it’s very difficult to get around the mindset that the piece of cloth you’re holding in your hand and are about to wipe yourself with was used for wiping purposes just a few days beforehand—and not necessarily by you. Maybe it’s different if, as in some families, each member had their own color/print cloths so they don’t end up being shared? After all, cloth menstrual pad users don’t mind washing and re-using a pad month after month as it’s their own and isn’t being used by anyone else, but somehow, the idea of washing blood out of a cloth and using it again doesn’t seem to squick people out quite as much as the though of re-using poop-cloths, even if they’re clean. In theory, using family cloths seems to be a great idea—they’re eco-friendly, reusable/sustainable, and would save us hundreds of dollars a year—but how many of us would actually go this route? Some people seem to be “okay” with the idea of using the wipes solely for after urinating, but would never consider them for any other use. Others claim that they would use them so long as each family member had their own set of cloths (as the thought of sharing other people’s bum-wipes is just too much for them) and some would just flat-out refuse to even consider trying them out at all. It’s quite possible that we’ve all become so accustomed to the habit of tossing away anything perceived as soiled that we can’t shift gears on this one unless there comes a time when we really have no other choice. 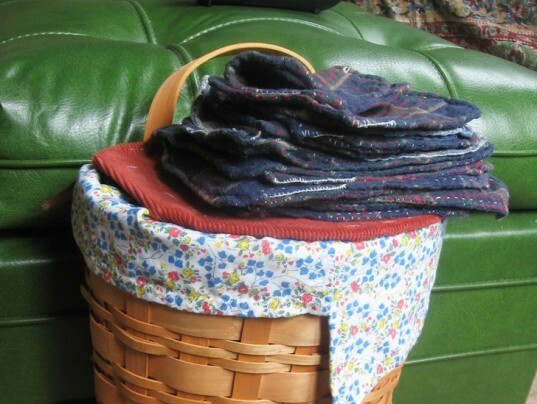 Have any of you used family cloths at home? If you have, what did you think of them? It's definitely a learning curve. I've found that smaller is better, but don't cut them too small because they will shrink in the wash. 8 x 8 inches is a good start. Wash them before use, because I find that brand new unwashed cloth is too slick and doesn't "pick up" well, at the risk of TMI. It gets slightly coarser in the wash, but not rough. I live by myself, so no need to worry about sharing. I wash them out in the sink in hot water after use, before washing them in the washing machine. Toilet Paper is obsolete and just plain nasty and Wet Wipes are causing expensive clogs in the sewers and septic systems. Cloth is better for the environment but I won't sign up to do the laundry! With modern plumbing we should be washing with water not smearing with wads of paper and the best way to do that is with a Hand Held Bidet Sprayer. It's better than a Bidet because it does a better job cleaning you, requires no new plumbing, costs under $100 and provides superior, healthier, money saving hygiene. See www.bathroomsprayer.com. I\'m surprised that dryers are still used. Being eco-friendly surely means using as little electricity as possible, having fewer wash loads, and using the sun as much as possible to dry and sterilise. I have a small sun porch and I dry clothes on fold up dryer frames there or in my craft/laundry room. Will still use recycled TP, one flush and it is all gone. You can buy a bidet attachment for less then $30.00 on amazon or ebay. We have two. One for downstairs and one for upstairs and we live in the US. Not everybody can afford a bidet I guess. How about keeping a bucket of water nearby so, when one is finished with a movement, splash water with one's hand on the bum, then wipe with a cloth. Much less yuck on the cloth and less washing to do. This practice is widespread in Asia where toilet paper is usually a couple of pages torn from a child's kindergarten storybook no longer in use, but not pleasant to touch. A bidet is a natural partner for reusable wipes. Sustainable, money saving and maybe best of all really clean. We have been using a bidet toilet attachment for almost 10 years. A few years ago we added reusable toilet wipes and made the whole experience even better. Since the bidet does the cleansing the wipes are just for drying off. We lay them out to dry after we use them rather than soak then wash them with the rest of the laundry at the end of the week. We wouldn\'t go back and hate it when we visit or travel. Here is a link for one of many such attachments on the market We originally bought a rather expensive one that used warm water. It was quite elaborate, involving electronics, and only lasted a couple of years. The much much cheaper one we are now using uses cold water but we are fine with it and it is more than five years old and still works like new.A bidet is a natural partner for reusable wipes. Sustainable, money saving and maybe best of all really clean. We have been using a bidet toilet attachment for almost 10 years. A few years ago we added reusable toilet wipes and made the whole experience even better. Since the bidet does the cleansing the wipes are just for drying off. We lay them out to dry after we use them rather than soak then wash them with the rest of the laundry at the end of the week. We wouldn\'t go back and hate it when we visit or travel. Here is a link for one of many such attachments on the market We originally bought a rather expensive one that used warm water. It was quite elaborate, involving electronics, and only lasted a couple of years. The much much cheaper one we are now using uses cold water but we are fine with it and it is more than five years old and still works like new. While my family don't use cloth wipes, I have a friends who's family does. They all have their own patterned wipes which are washed together, then separated into different patterned (made with same material/pattern as wipes) drawstring bags. These then hang on hooks on the bathroom wall. Sadly my family can't get past the "ick" factor. I've been using them for 3 weeks now, and I love them. However, I only use them for urination. I absolutely cannot stomach the idea of using them for #2. No way, gross..IMO. The reason I chose to use cloth is not for environmental reasons - it's to save money - pure and simple. My cloths are single layer, white. I just bought 2 metres and then used pinker scissors to cut the squares. There is a little fraying when washed, but it's not too bad and it only happened after the 1st wash. I don't have a sewing machine and was not going to spend $20 for 20 wipes (plus shipping) from people who sell them online. 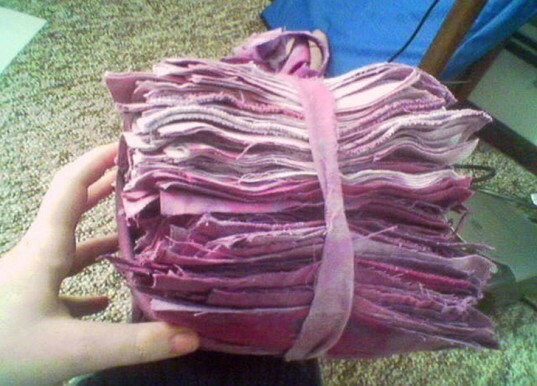 The pinker scissors cost me triple the price of the flannel, but that's a small price to pay when considering I'd need about 100 squares to last me a full week. I'll probably replace the flannel wipes every 6 months - which is a cost of just $13 for 2 metres. All in all, I'm very happy I've switched and they feel so much better to use than paper. Oh, and I live alone so there is no sharing (I wouldn't share these with anyone else). Forgot to mention that a good sunning removes almost all stains...especially if you SUN them BEFORE putting in the dryer. Have a great echo-friendly day, & thanks for all your efforts for a greener planet. HIGHLY RECOMMEND. I've been using cloth wipes for over five years & definitely recommend them. I live alone so don''t have the concern of sharing. I got a fabulous deal on baby washcloths...6 per pkg & 4 pkgs for $1. I bought $10 worth. Do the math...that's a lot of cloths. Trust me...I shared. I think these baby wash cloths are a perfect size & I like that the edges are all secured in binding. I use TP for first "rear" wipe & then cloth. I do not soak my cloth - nor did I soak soiled diapers. Cloths are deposited in an open $1 Store basket. I wash only when I'm about to run out of clean cloths, about every 8 - 10 days. 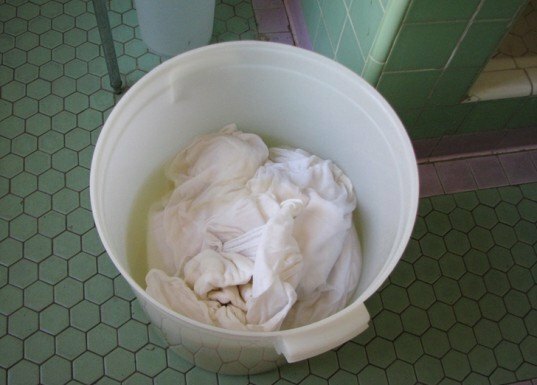 As I grab a clean cloth I fold it into fourths; after a simple dry, I fold it over & place it on toilet tank & use the clean side as needed next visit. On washday all are tossed into washer, one cold wash cycle w/no soap. Next cycle I use regular detergent & hot water & never bleach. Third is just a hot rinse. These are all run on low water level. Toss in dryer on low heat & they're dry in 10/15 min & piled into the pretty little basket in the bathroom. If I didn't share laundry facilities that I had to pay cash for I think I would. I doubt my husband would though! it would have to be just me! I can see why someone who has cloth diapered would consider this, but unless I smelled bleach, I would be very concerned to see it in use. If they were simply used to dry off, there is some limit on the number of germs, but if they're used to wipe, you'd have to treat dirty ones like they're dirtier than raw chicken (salmonilla is killed by hand sanitizer, some common stomach bugs aren't). You need to use a cleaning method that kills both bacteria and viruses. I'm more comfortable with using reusable cloth on infants, who haven't had the opportunity to pick up stds, utis, or a particularly wide array of gut bacteria. Even there, I've learned that it's important to be strict about immediately and thoroughly washing your hands, and everything you touched on the way to the sink. It only takes one case of norovirus (a really unpleasant stomach bug) to learn why people are reflexively grossed out by feces. Gwenny - It's quite reasonable to install and remove a sprayer on most apartment toilets. If you search for diaper sprayers, you'll find an array of choices under $50, easily available in the US. I would personally like a bidet. But they are damned rare in the US. If I ever own a house I will have some sort of water cleansing device . . like the Washlet, which is made in Japan, or some bidet attachment. I try to be as eco-conscious as possible, but this is drawing the line. I do use recycled tissue and toilet paper. Green Forest is great and recently I discovered some made from sugar cane fiber! It's pretty incredible. Many of us who try to lead eco-conscious lifestyles are likely already using many reusable, washable fabric items for both household and personal use, but what about reusable toilet wipes? Cotton dish cloths, washable baby diapers, handkerchiefs, and Glad Rags-type menstrual cloths are growing in popularity, but there's one area in which we may all be eco-offenders: the 'loo. Enter "family cloths", also known as reusable toilet paper. These are washable strips of cotton flannel that folks can use to wipe with, but are they just too gross for most people to consider? There aren't many of us who would truly balk at the thought of using washable cloth diapers for babies and toddlers, but the thought of wiping away our own excretions with strips of flannel cloth and then washing them later seems to be an entirely different story. Most pro-cloth websites do a good job of dispelling the hideous imaginings that many may have about whether the practice is sanitary or not. Advocates have described a variety of methods that they use for keeping things clean and tidy. In theory, using family cloths seems to be a great idea—they're eco-friendly, reusable/sustainable, and would save us hundreds of dollars a year—but how many of us would actually go this route? Some people seem to be "okay" with the idea of using the wipes solely for after urinating, but would never consider them for any other use.